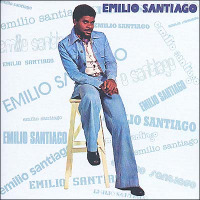 In retrospect, it's not surprising that Emilio Santiago chose a track list steeped in Latin music history and a long list of some of the best players in the game. It was clear from early on that Santiago had the potential to make a significant contribution to the genre. What's remarkable about this 1975 debutreissued by Far Out Recordingsis how in command he sounds at 29. This 10-track LP came just two years after his debut single for Polydor Records, "Transa de amor." The album offers up the work of songwriters Ivan Lins, João Donato, Jorge Benjor, Nelson Cavaquinho, Guilherme de Brito and others. It is very much of its era. Given the level of interest in that period presently, it's a well-timed repackaging. The album opens with the immediately recognizable "Bananeira." The bossa nova classic Bebel Gilberto turned a new generation onto at the beginning of the last decade was written the same year Santiago recorded it. João Donato penned the music; Gilberto Gil the lyrics. Durval Ferreira's and Pedro Camargo's velvet-smooth "Porque Somos Iguais" is another highlight. It features a traditionally romantic arrangement by Dori Caymmi and Santiago in full-crooner mode. It takes a collection of big, big talents to pull off something like this. Santiago and Co. nail it. That's followed by the up-tempo number "Batendo a Porta," co-written by João Nogueira and Paulo Cesar Pinheiro. João Donato's arrangement and Santiago's vocals are sufficiently traditional to provide both artistic and documentary value. Despite the strength of this album, Santiago didn't see commercial success until the late 1980s. A collection of Brazilian music entitled Aquarela Brasileira, on the Som Livre label, finally did the trick. This early release deserves a bigger reception than it originally received.